Liverpool were superb in trouncing Bournemouth 4-0 in Saturday’s early Premier League kick-off, moving to the top of the table as they did. Goals: Salah 25′, 47′, 76′, Cook (og) 67′. Perhaps for the first time, Liverpool’s two midfield summer signings were in the team at the same time on merit. Naby Keita‘s midweek performance earned him a starting berth, albeit more from the left side than a true central role, while Fabinho anchored the midfield line after a succession of good recent displays. The expectation has been, almost since the moment the Brazilian’s signing was suddenly announced, that they would eventually comprise Jurgen Klopp‘s first-choice midfield. It has taken time for that to finally happen, given injuries, a bedding-in period and Klopp trying to find the right balance, but we may now finally be seeing them both becoming established in the starting XI. Fabinho was his usual self: quick to put in the challenges, adept at covering in the channels defensively and a little unsure when on the front foot and passing into the final third. Keita showed further glimpses of his ability to dominate and drag the midfield forward, especially early on. Both need to become 90-minute players in this capacity, rather than doing so sporadically. But the signs continue to be there, the improvements for each player remain apparent, and it surely cannot be too much longer before they are paired in a double pivot for the first time. Few chances, plenty of kicks… three goals. As a forward leading the line, away from home, this was about as perfect and efficient a performance from Mo Salah as Klopp and the travelling fans could have hoped for. It hasn’t always been an easy transition for Salah into the true centre-forward role, but given space to run in behind on Saturday and a succession of raking through-balls looking for his movement, he had a field day. 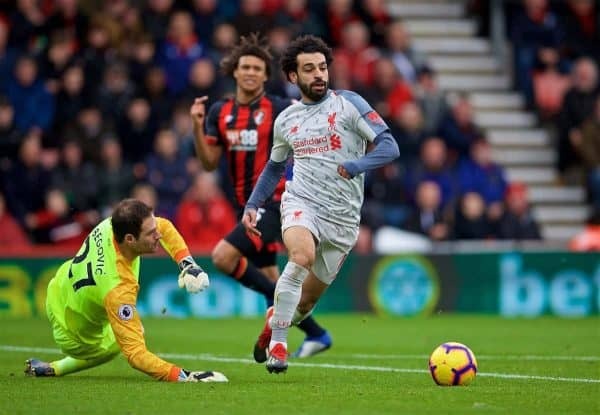 Bournemouth couldn’t cope and didn’t alter their approach, leading to chance after chance to free the Egyptian King. His channel-running and hold-up play was also good, but his finishing was imperious on this occasion. 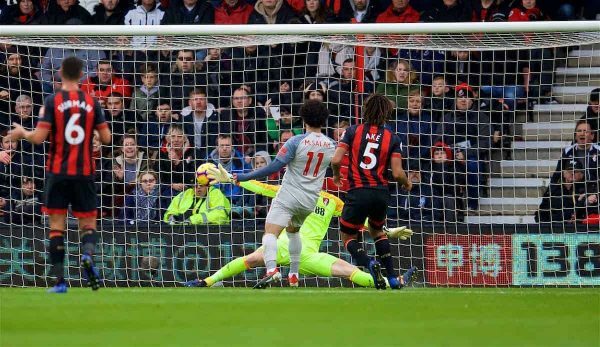 Salah’s third was sublime, highlighting his confidence, technical ability and the level of fear that the Cherries’ defenders had in him. There’s a case to be made that this was Liverpool’s best all-around performance of the season, certainly since the early weeks at least. They were dominant throughout, created a succession of chances (which hasn’t always been the case, even as they’ve gone unbeaten in the league) and were rock-solid defensively. 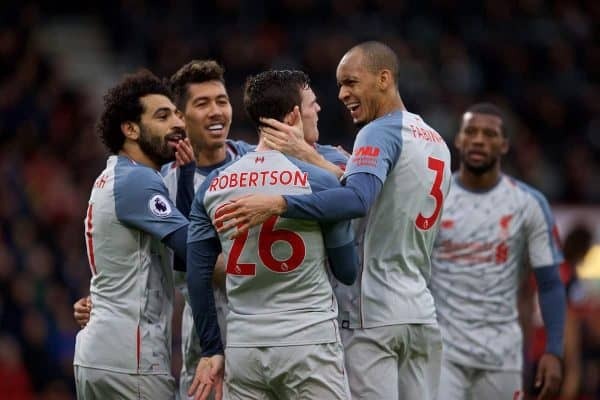 Even with players injured, one or two out of their natural roles and away from home, this Liverpool team never looked anything other than utterly assured of victory. It was a true red machine, rolling in unstoppable and unflappable fashion to a victory – and it was great to see plenty of fast-paced exchanges in attack take place. 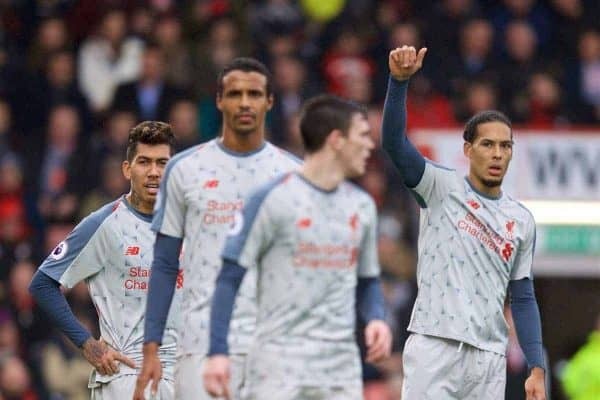 Teams can’t stop the Reds playing that way when they get going, and they’re finding it tough to break down Virgil van Dijk and Co. at the other end, too. Almost at the halfway stage of the season now and Liverpool are not just still unbeaten, but outright top. Man City play later in the day, a first real test for them for some weeks domestically, and any dropped points by the reigning champions will mean the Reds are, at worst, level on points at the top. It’s testament to the brilliant job done by the manager this season and to the improvement of the team as a whole. Regardless of what happens at Stamford Bridge, where Reds fans might be faced with the rare prospect of cheering on Chelsea, this has been an almighty mini-run of games from Liverpool. 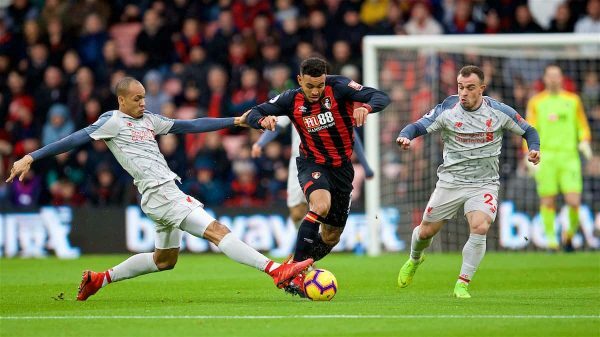 A late win in the derby, a come-from-behind victory at Burnley and now a thoroughly resounding success at Bournemouth: we couldn’t be in better form heading into two enormous games. If Liverpool come through next week with another two victories to their name and progression into the last 16 of the Champions League, rest assured that another memorable season lies ahead. It’s more than possible that the late subs gave a glimpse into Klopp’s thinking for the Anfield match under the lights: Sadio Mane back in his old role on the right, with Keita remaining on the left in the 4-2-3-1. Don’t be surprised to see that lineup from the start, leaving Fabinho and Gini Wijnaldum to continue their impressive pairing from deep. It’s a week to look forward to, and one we might remember for some time.